Get set for an amazing excitement filled day, which will push you to your limits, and test your skills and endurance to the maximum. Taking part in teams of three, you will tackle the Derbyshire Dales, head on! 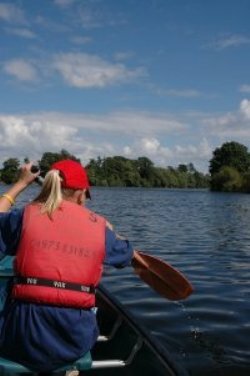 Set in the stunning Derbyshire Dales and the beautiful Peak District National Park this event offers a test for all challengers, experienced or novice. This one day will leave you feeling exhilarated and re-motivated, ready for the next challenge, whether it's at work or on your next outdoor adventure. We shall begin our Adventure Race in the small Peak hamlet of Ilam. You will stay overnight here on Friday evening, before receiving a formal event briefing early on Saturday morning. Two teams travelling in opposite directions around the course will set out; one on foot, one on bike, on their first stage. The bike stage will head towards Carsington Water, where they will take to the water, in Canadian Canoes, before continuing on bikes to the final transition. 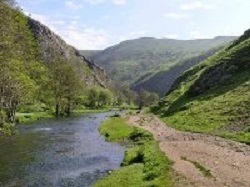 Here participants will leave bikes (with support vehicle) to make the final foot stage via stunning Dovedale to Ilam once again to complete the event. 09:00 - Meet at Ilam YHA (nr Ashbourne, Derbyshire) for Challenge brief. 10:00 - Event start, cycle to Carsington Water - 8 miles. 10:45 - ETA Carsington Water - transition to Open Canoe stage - approx. 3 miles. 12:00 - Rejoin Bikes and head off on trail ride North - via Midshires Way - 20 miles. 14:00 - Expected arrival at final transition - from bike to walk. 14:00 - Suggested lunch location -tea / coffee Available. 15:00 - Stunning Walk via Dales finally through Dovedale to Ilam - 12 miles. 17:00 - Expected Earliest arrival at Ilam - event end. 19:00 - Expected latest arrival at Ilam - event end. 18:30 - Refreshments and congratulations all round! Optional extra, please call us to discuss. What is a Level 3.5 Multi Activity Challenge Like? These challenges are either longer, higher, or span several days. In the case of single day events, you can expect around 8-10 hours of full on multi activity. In the case of a multi day challenge, you can expect a lower daily duration - but of course - the effort is sustained over a longer period. You need to be used to challenging physical exercise for these events, and to enjoy your training, and to do it regularly. Longer duration challenges are likely to be easier in terms of the physical effort, however, you will need to be more resilient - due to simple living conditions - i.e. using same clothes for several days, simple food, and maybe camping - this forms an integral part of the challenge. How Fit Do I need to be to join a Level 3.5 ‘Multi Activity Challenge’? You need to have good endurance for these events. You must be used to doing longer days in the outdoors - 7-8 hours. You should be doing regular exercise - with some intense outdoors exercise. You should be used to long rides, long walks, and all round challenging days. You need to have balanced the need for multiple forms of exercise in your training - including some upper body work, and some flexilbility. Please note, it is extremely important for this physical challenge that you are in good health. If you have any pre-existing medical conditions, please consider carefully whether you should be joining the challenge. Please ensure you fill in the booking form accurately and honestly, this is important. In the case of serious conditions (epilepsy, diabetes, heart conditions, recent illness or operations), please discuss the challenge with your GP. Please also ensure you notify us of any allergies or similar. It requires stamina and good aerobic fitness - but good willpower will also come in handy! Failure to disclose medical conditions is a serious omission - that could have serious repercussions on any of our challenges. Accommodation, meals, transport to and from the event. Snack Foods - we recommend good slow burning items - nuts, dried fruit, cereal bars etc. By nature all activities contain an element of risk.Your marshals/leaders will be first aid qualified and will carry the appropriate safety kit for the activity, such as mountain safety shelters, walking rope and from time to time mobile radios. Safety equipment carried will be appropriate to trip. The marshals/leaders primary role is to ensure your safety, but it is your responsibility to listen to their guidance and instructions. As you know the weather in England is unpredictable, so it’s best to prepare for hot or cold conditions. Bear in mind you will be on the water and it is likely you will get wet, so please bring suitable clothing for this. Equally during the summer, you could find hot and sunny conditions, so please be prepared with plenty of fluids, and sun protection. By booking an event with Adventure Cafe, you agree to these standard terms of booking. Please ensure that you read the appropriate document for your type of event carefully. You should fill in the Google Form - linked here below, and then please call us on 01823 444 246 to advise of your payment method. We can accept card payments over the phone, or Bank Transfer. Please note that your space is not confirmed until you have received your booking receipt.